COOL WEATHER SLEEPING BAG: With a comfort temperature up to 50F, our sleeping bag is suitable for users in spring, summer and autumn. 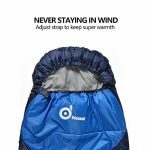 It is filled with hollow fiber so it is breathable and comfortable even in summer. 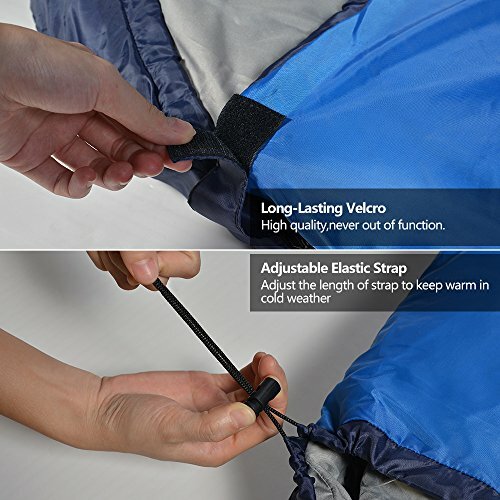 Also can adjust the length of the strap to keep warm in cold weather. 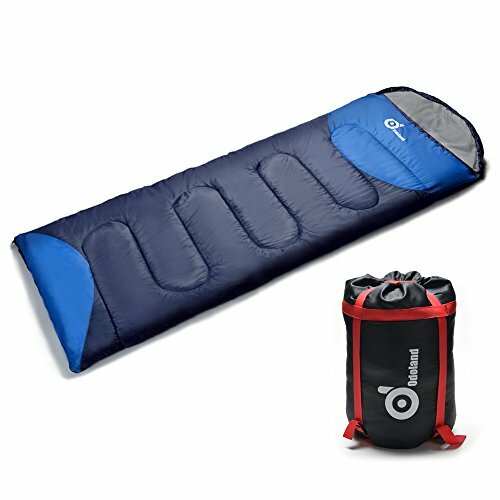 COMFORTABLE, LARGE ENOUGH FOR MOST ADULTS: The sleeping bag is constructed of waterproof polyester cover with soft W/R 190T pongee cire and 250g/m2 Hollow fiber so as to keep comfortable throughout the night. 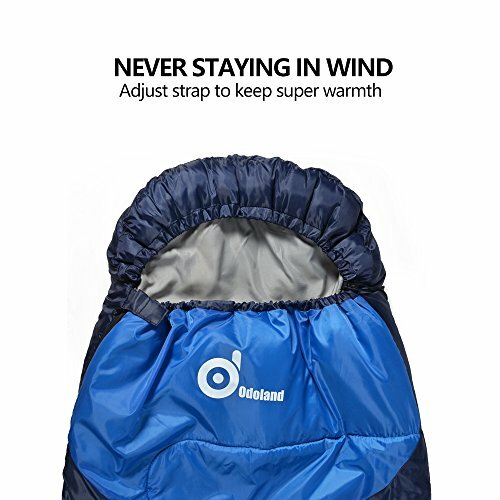 It has long-lasting Velcro and string design in the hat to reduce the heat loss and keep warm. The size of 190 cm/75 inch x 75 cm/29 inch provides comfortable laying for most adults. 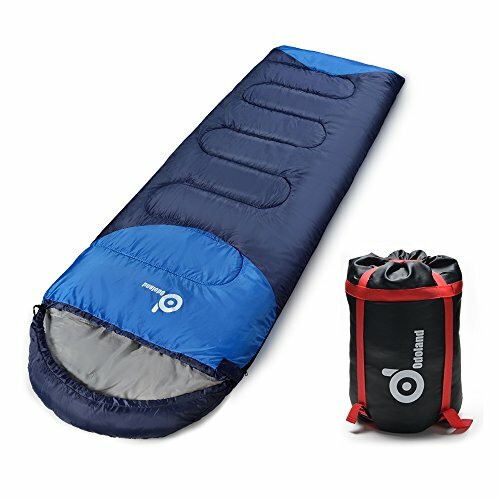 PORTABLE, FOLDABLE AND FLEXIBLE: Only 3 pounds, ultra-light for backpacking or camping. It is very easy to roll up and also easy to store. 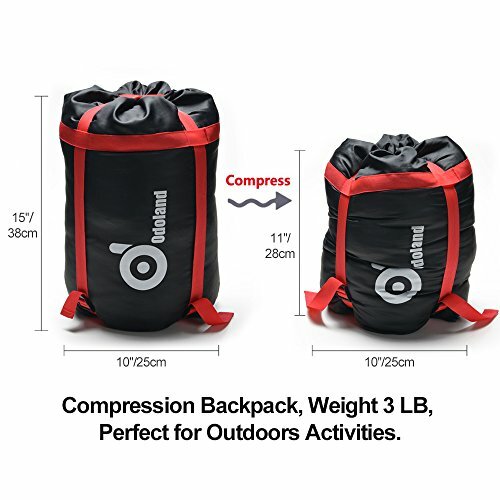 It comes with a compression bag. You can easily store it into the storage bag, which helps you easier to take for any trips. ODOLAND 3-Season Sleeping Bag is designed for those who want a portable and comfortable sleeping bag for outdoor camping activities in warm-weather camping . 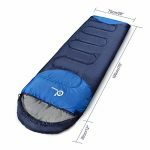 It is made of polyester fiber and soft pongee liner and is of a medium size, which provides users a comfortable laying experience. It is easy to compress, to roll and to clean. If you are about to take a camping trip, it will be your perfect camping companion. Weight 3 LB, Perfect for Outdoors Activities. 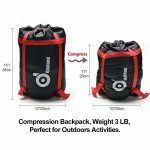 Suitable for survival, backpacking, biking, scouts, camping, hiking and other outdoor activities. 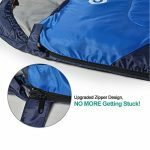 DURABLE WITH STURDY STRUCTURE: The layer is made of durable water-resistant material and the zippers are sturdy. With upgraded zipper design, it will no longer get stuck. The lining on the bag is made of polyester material. 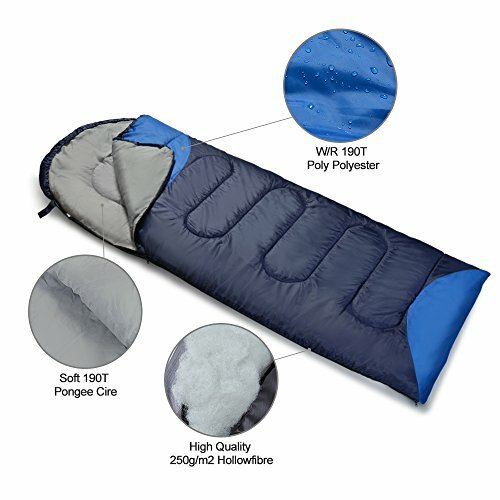 It is waterproof and can retain body heat for longer durability. MUTI-FUNCTIONAL IN VARIOUS OCCASIONS: It is ultra-light, easy to carry and easy for storage. 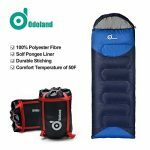 It is suitable for all outdoor activities, such as camping, hiking, backpacking, cycling and even for survival.